We meant to go out on the river on Friday evening, but misread the tide times. We meant to go out on the river on Saturday, but the skies were black, the rain fell, the wind blew and the storm warnings warned dolefully. We meant to go out on the river today, and made it! Halton Quay is a very convenient quay in some ways: it's easy to get to, has plenty of parking and is used almost entirely by fishermen and canoeists, so it's not too busy. Unfortunately the other thing is has in generous quantities is MUD. Not too bad on the way out, because we arrived not long before high tide. The tide and the wind together helpfully wafted us up the river, listening to the sound of the wind in the reeds. I love that noise. It reminds me of childhood holidays in the Norfolk Broads. The other noise we could hear behind us as we went up the river was folk music. We didn't recognise it, but another canoeist told us later that it was a riverside concert by one Mad Dog Mcrea, which they had gone down to listen to. Our fellow-canoists had gone down the river to steal music with their ears! Shocking behaviour. We did no such thing. 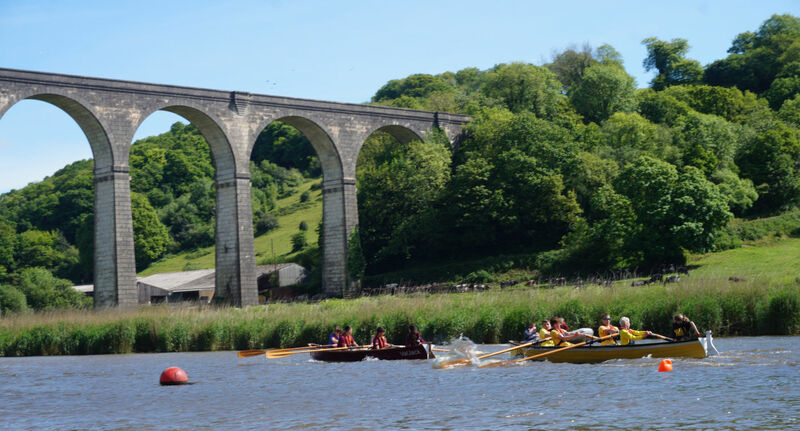 We went up, and found that the Calstock Regatta flashboat races were not quite over (though we did meet a lot of boats on their way down: clearly most people had gone rather earlier than we did). Here are some of the flashboats racing. Oh goodness, the MUD when we got back to the quay at last! Halton Quay is by far the muddiest spot we launch from: my legs and hands were richly covered in it by the time we had got the boat out of the water and back on top of the car. We had to take the canoe and scrub her with a hose once we got back, and the thick brown glutinous stuff was very hard to get off. Worth it though. Looks like a beautiful day! I love the photo of the boats and the arches! It was fabulous. It's so peaceful. I love the flashboat races, they are an old wooden design, very slender and elegant, designed for speed and beauty, not so much stability. Damnit! I would have gone and stolen music from Seth Lakeman with my ears in a heartbeat. So beautiful. And I think your photos do capture the peace. I love canoeing and that looks so beautiful! !